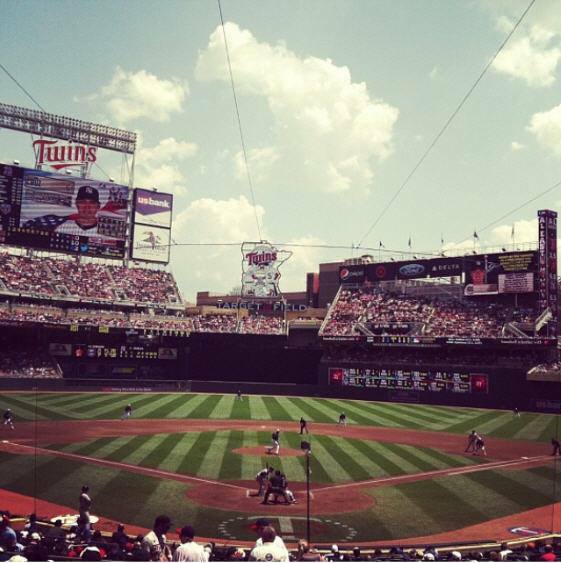 Reasons We Love Our Minnesota Twins | Stay Comfy, Minnesota! Minnesotans are loyal fans of our Minnesota Twins baseball team. We seem to have a love/hate relationship with all our sports teams, but probably more so with the Twins than any other team. Every season we start with fresh hopes and dreams and they give us a ride for sure. Many times (lately) they land near the bottom, but they’re also the team that has given Minnesota two World Championships – so we can’t ever give up on our favorite team. Here are a few reasons why we love our Minnesota Twins. Fabulous Ballpark – Target Field opened in 2010 and was quickly named as the best baseball experience by ESPN magazine. Since then, Target Field is consistently recognized as one of the top ballparks in America. What makes our baseball stadiums so great? The Budweiser Roof Deck, the outdoor Target Plaza and downtown location, heated viewing areas, and mass transit options and nearby parking. In center field, travelers will recognize the “Shaking Hands” sign featuring Minnie and Paul which illuminates when the “Twinkies” hit a homer. Target Field is the proud host of the 2014 All Star Game. Baseball is America’s Favorite Pastime – Baseball brings people together, the game is part of the fabric of America. There are no age limits to play or watch the game. It can be highly organized or played in a dirt lot. Baseball is a lifetime love – fans start playing or watching the game as a youngster, and then keep watching until they’re in the old folks’ home. Generations come to together in Target Field to watch batting practice, sit in the outfield in hopes of catching a ball, and stay late to watch the sunset on a beautiful day. It’s a wholesome experience for the entire family. Great Food – You can’t properly enjoy a Twins game without a few good eats. Target Field is known for its great ballpark food – of course it has all the expected items like hotdogs, sodas and popcorn. But it has Minnesota State Fair specialties like cheese curds, pork chops on a stick and fried pickles. And then of course there are various Italian and Mexican choices and don’t forget sweets! Add in high-end burgers and items from some of the Twin Cities finest restaurants, there is something for everyone at Target Field. Don’t forget to wash it all down with a favorite cold beer from a local Minnesota brewery. Minnesota Loves the Underdog – We love rooting for the team that everybody counts on losing – we have a lot of experience with this in Minnesota. The team that is counted out before the game begins. The team that nobody gives a chance. It’s no secret that our culture loves movies like Remember the Titans. We want the little guy to win and the big bully to lose. And since the Minnesota Twins are a small market team and are 24th on the payroll list, it makes us the little guy when compared to the Yankees, Red Socks and Dodgers. GO TWINS! Tradition – Baseball is a game of individual skill and yet every position is important for the team. We all have our favorite players and our favorite all-time teams. That’s why we have statues of some of the extra special ones, Harmon Killebrew, Kirby Puckett, Rod Carew, Tony Oliva and our own Carrier favorite, Kent Hrbek. It’s why we have our very own native Minnesotan, Joe Mauer, on billboards around town selling us ice cream. We love our Minnesota Twins because they’ve given us over 50 years of quality players and memories. Thanks Minnesota Twins. So, as the MLB baseball season kicks off, let’s support our hometown team! Get out to Target Field and enjoy America’s favorite pastime with family and friends. While you’re there, don’t forget to cross your fingers for our Minnesota Twins, and carry a good luck charm on their behalf for a successful 2014 season. Go Twins! This entry was posted in Carrier, Kent Hrbek, Minnesota, Minnesota Twins and tagged Carrier, Minnesota, Minnesota Twins. Bookmark the permalink.